Audio power amplifier is an important part of the sound from the sound system. Audio power amplifier IC LM 3886 with an audio power amplifier unit is a very capable and able to produce 68 watts power rata2 4 ohm load, and is capable of producing power of 38 W with a load of 8 ohms. With well-placed sound 20Hz-20kHz playback is also included in the power amplifier LM3886 Audio. LM3886 audio power amplifier is equipped with spike protection that will protect the output circuit overvoltage, undervoltage, overload, konrsleting power supply, thermal runawaydan peak temperature. Audio Power Amplifier LM3886 also features a noise-canceling system that can keep the sound from the noise well. Audio Power Amplifier Series LM3886 Circuit. 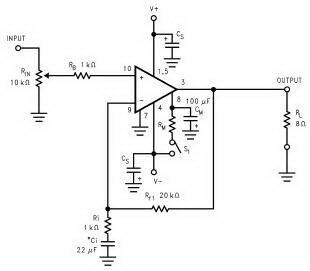 0 Response to "LM3886 Audio Power Amplifier Circuit"